Papaya tree and fruit at the Bloedel Conservatory. Native to tropical America, Carica papaya is a semi-woody, short-lived perennial usually with hollow, unbranched stems and petioles. 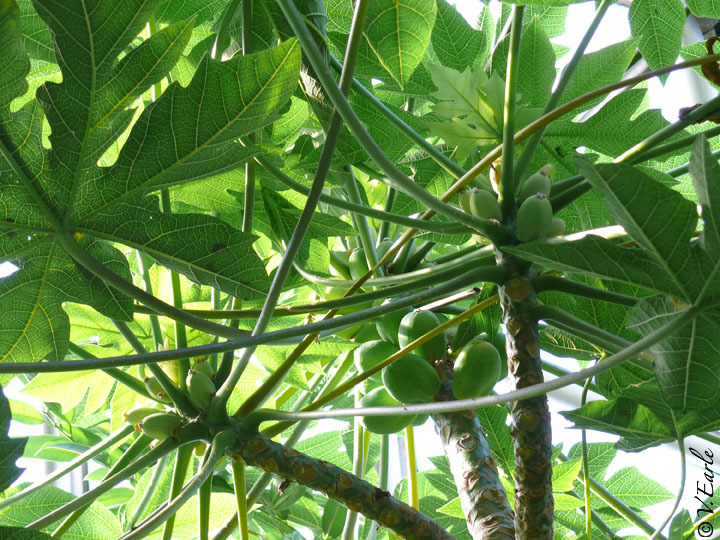 Papayas can grow to a height of 9 meters (30 feet) with a width of one to two meters (three to six feet). Leaves are large, broad, fan-like, and deeply lobed on two-foot stalks arranged in a crown atop the stem. Carica papaya reaches maturity within a year, but typically lives only five or six years. As plants are typically male or female (they can be hermaphrodites), both sexes are required for pollination. Fruit is produced throughout the year, but take six to ten months to ripen. Full sun and year-round warmth are a necessity. While there are over 35 varieties of papaya, the two most familiar are from Hawaii and Mexico. The fruit of the Hawaiian variety is pear-shaped, weighs one to two pounds, with a yellow skin and orange or pinkish flesh when ripe. Mexican papayas bear much larger fruit – up to 10 pounds in weight. These can grow up to a foot long, with yellow, orange or pink flesh and a milder flavour. The black seeds of the fruit are edible, and have a bitter, peppery taste. Because of the papaya’s delectable sweetness and soft, butter-like consistency, it is no wonder this fruit was reputably called the “fruit of the angels” by Christopher Columbus. 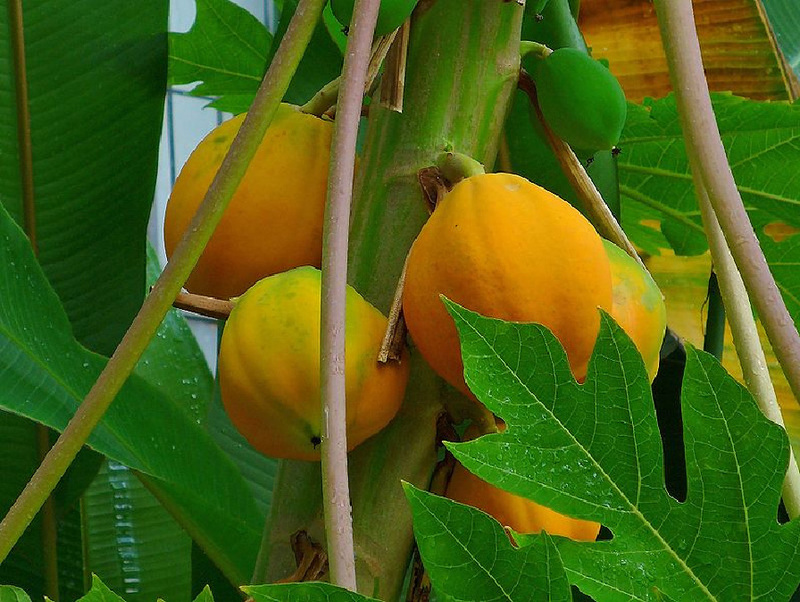 The first written reference to papayas dates back to the early 16th century. Breton’s Dictionaire Caraibe records the name as ”ababai”; Fernández de Oviedo, official chronicler to the Spanish crown, noted papaya as the official name in Hispaniola. This name stuck as the plant was carried west to the Philippines, then across Asia and into Africa in the 16th century. 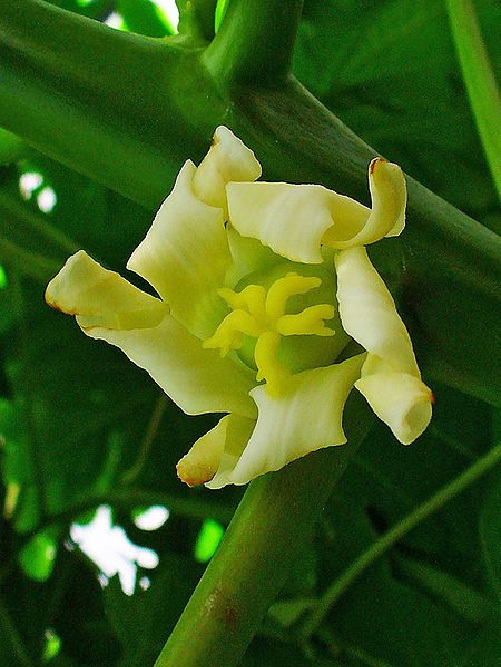 Some now assume that “papaw” or “pawpaw” was a corruption of papaya. Carica papaya contains a watery-white sap that, in turn, contains two important enzymes: 1) a proteolytic enzyme that partially breaks proteins down to peptone, a water soluble substance; and 2) papain, an enzyme that further breaks down proteins to their amino acid building blocks. As a result, papayas have had multiple uses throughout the ages and the world. • Ancient cultures used papayas as a remedy for indigestion and digestive problems for centuries. • In South America, the juice of the fruit has been used as a meat tenderizer for hundreds of years. • During the filming of Indiana Jones and the Temple of Doom, Harrison Ford was treated for a ruptured vertebral disc by having papain injected into his back. • In Guinea, tanners will rub the hide of a freshly-killed animal with wood ash, wrap it in papaya leaves, then leave it overnight. In the morning, hair is easily removed from the hide. • Leaves are used as a soap-substitute for laundry, and as effective bleach for soaking clothes. Ash of the burned plant is also used to make soap. 1. Brenzel, K. N. (2007). Sunset Western Garden Book. Menlo Park, California: Sunset Publishing Corporation.